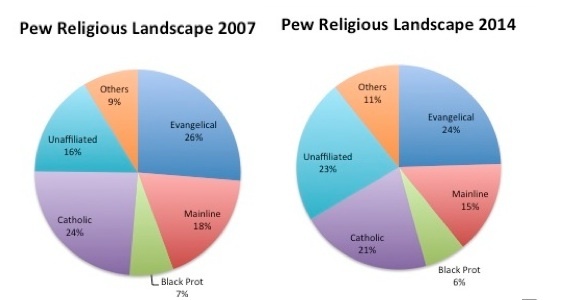 Interesting nuanced initial interpretation of the Pew study. This study will provide part of the foundation for a class I’ll team teach with a friend next Spring. Thanks, Tim. I taught sociology at ONU from 1981 to 1990. Maybe by the time you teach the class I’ll have access to the 2014 data instead of 2007. I’d be glad to be a resource for the class if that would be helpful. Once again, John, thanks for a sensible interpretation of the data. Most pundits have their opinion and conveniently slice the data to support that opinion. You are certainly a teacher in all you do! I’m confused by the implication of your concluding statement. What counts as “legitimate faith,” and why is the “the legitimate faith of those who regularly attend church” more important to our understanding than the (illegitimate?) faith of those who say religion is important to them but rarely attend a church? There are limits to how much I can unpack in one blog post. The purpose of this piece was to critique those who seem intent on celebrating a decline of mainline churches by assuming that they are all “cultural Christians”. The data simply don’t support that so I wanted to say that we start with where people are. By “legitimate”, I mean that these are people who say that religion is important to their lives. It’s not a value judgment but a reflection of their own assessment. That said, there is a significant pattern of people of faith who no longer attend church regularly. Josh Packard, a sociologist at Northern Colorado, has a book out on “Church Refugees” that begins to explore this pattern. My copy of the book arrives this week and I hope to write on it in the near future.